Addie Baum is "The Boston Girl", born in 1900 to immigrant parents who were unprepared for and suspicious of America and its effect on their three daughters. Growing up in the North End, then a teeming multicultural neighborhood, Addie's intelligence and curiosity take her to a world her parents can’t imagine - a world of short skirts, movies, celebrity culture and new opportunities for women. Dellarobia Turnbow is a restless farm wife who gave up her own plans when she accidentally became pregnant at 17. Now, after a decade of domestic disharmony on a failing farm, she encounters a shocking sight: a silent, forested valley filled with what looks like a lake of fire. She can only understand it as a cautionary miracle, but it sparks a raft of other explanations from scientists, religious leaders, and the media. In 1918, after four harrowing years on the Western Front, Tom Sherbourne returns to Australia to take a job as the lighthouse keeper on remote Janus Rock. To this isolated island, where the supply boat comes only four times a year and shore leaves are granted every other year at best, Tom brings a young, bold, and loving wife, Isabel. Three years later, after two miscarriages and one stillbirth, the grieving Isabel is tending the grave of her newly lost infant when she hears a baby’s cries on the wind. A boat has washed up on shore carrying a dead man and a living baby. When the police started asking questions, Jean Taylor turned into a different woman. One who enabled her and her husband to carry on when more bad things began to happen... But that woman's husband died last week. And Jean doesn't have to be her anymore. There's a lot Jean hasn't said over the years about the crime her husband was suspected of committing. She was too busy being the perfect wife, standing by her man while living with the accusing glares and the anonymous harassment. In the late 18th century, Rene Sel, an illiterate woodsman, makes his way from Northern France to New France to seek a living. Bound to a feudal lord, a seigneur, for three years in exchange for land, he suffers extraordinary hardship, always in awe of the forest he is charged with cleaning. Rene marries an Indian healer with children already, and they have more, mixing the blood of two cultures. Proulx tells the stories of the children, grandchildren, and great-grandchildren of two lineages, the Sels and the Duquets. Award-winning author William Kent Krueger has gained an immense fan base for his Cork O’Connor series. In Ordinary Grace, Krueger looks back to 1961 to tell the story of Frank Drum, a boy on the cusp of manhood. A typical 13-year-old with a strong, loving family, Frank is devastated when a tragedy forces him to face the unthinkable - and to take on a maturity beyond his years. Laura and Casey were once inseparable: as they floated on their backs in the sunlit lake, as they dreamed about the future under starry skies, and as they teamed up for the wild scavenger hunts in their small California lakeside town. Until one summer night, when a shocking betrayal sent Laura running through the pines, down the dock, and into a new life, leaving Casey and a first love in her wake. But the past is impossible to escape, and now, after 17 years away, Laura is pulled home and into a reunion with Casey she can’t resist - one last scavenger hunt. I can't put my finger on why I like this book so much. Anna proves to be a three dimensional character and the men in her life interact with that beautifully if not somewhat unexpectedly. The narration is executed with rich texture and the tone really helps to illuminate some of the era's slang. All the characters are vividly written. It was almost like watching a fabulous wartime movie. I hope a movie is made from this book. ! What a great story! Well told; superb narration, strong characters, great plot! It brought me back to the streets of Brooklyn of my youth. I have no idea how it happened, maybe it was after I restarted the book for the third time. After the first two times I thought I was in the groove of the book. But after round three I was still completely lost. I was put off by the back and forth narration. That might have been one cause of my overall confusion. Heather Lind has a beautiful voice. Almost hypnotic. I had to pinch myself a couple of times so I would sit up straight and be an active listener. It could have been I didn't listen to this book from beginning to end in one sitting. Maybe, but I usually follow most other books. I think it was the story. A long, slow moving story. Still love Jennifer Egan. Just not this one. Wonderful, thoroughly absorbing novel that explores the lives of almost-inadvertently remarkable everyday New Yorkers, in the 1930s and the early 1940s. Anna, her father Eddie, nightclub owner Dexter. They're so wonderfully alive. 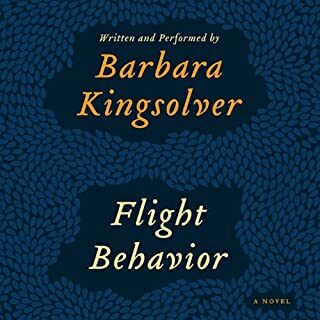 This novel is more &amp;quot;traditional&amp;quot; than Egan's Pulitzer-winning &amp;quot;Greetings from the Goon Squad,&amp;quot; but it's nevertheless an utterly contemporary exploration of who we believe we are, and our relation to where we live and how that fuels our dreams. More than the majority of novels set in New York, Egan's makes us aware of the sea that surrounds and defines the city. She plunges us into another age, and we are there as if by magic -- this is a historical novel that feels lived-in rather than researched. 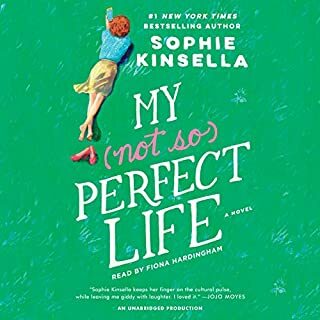 The alternating voices in this audio book give it an added dimension, and Norbert Leo Butz, Heather Lind and Vincent Piazza capture the soul, longing and yearning of their characters. A triumph. I read this book because I was interested in the unusual historical take on the War. The descriptions of diving and sea battle were well researched and interesting. But the plot was convoluted and sentimental with too many coincidences. Instead of writing in the language the characters would have used, Egan embellished the third person narrative voice with the kind of literary and metaphoric language one might find in a ladies' Victorian romance. All in all, full of literary dissonance. The readers were only fair. Anna's character was rendered even more soppy by the febrile excitement of the reader, whose lisp seemed oddly artificial and annoying. The male reader was simply bland, unable to breathe life into the diverse cast of characters he had to portray. I didn't hate my time listening to it, but looking back, I can't believe it was so long without really providing any substance. I felt like there was no climax. I was waiting for something spectacular to happen, and then it just ended without really giving any satisfaction. The sea is sometimes beautiful in Manhattan Beach, but it is also dangerous and deadly. Anna goes with her father Eddie Kerrigan to see mob boss Dexter Styles at Manhattan Beach in Brooklyn at the start of this book, during the Great Depression, as a 12-year-old. 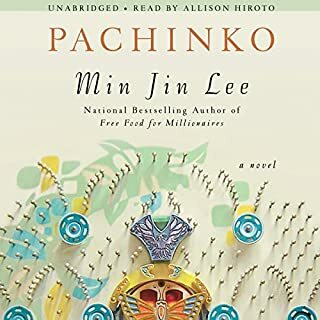 Ten years later, her father has disappeared, she is a wartime worker at the Brooklyn Navy Yard hoping to become a diver, and she becomes reacquainted with Dexter, who she thinks knows what happened to her father and maybe even had something to do with it. That is not much plot for a 15-hour book, but this is a literary novel that is about a time and a place and the characters who inhabit it. 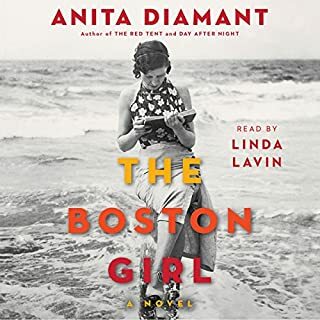 The pace is slow, the plot (as thin as it is) has some major holes, but the characters are worth the listen, if you take to them -- and the sea as well as the city are characters in this story as much as Anna, Eddie, and Dexter. 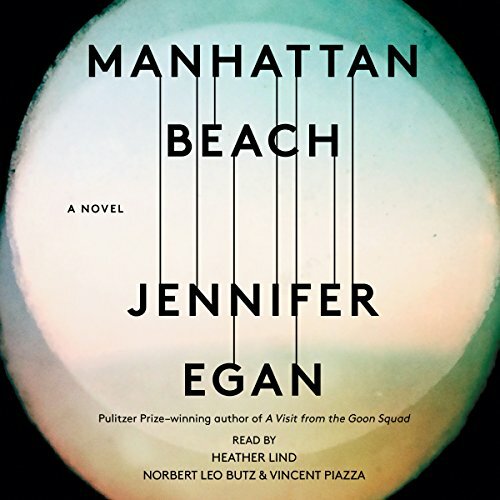 I had mixed feelings about Jennifer Egan's acclaimed Goon Squad, and even though I weigh in on the positive side of Manhattan Beach, I remain unconvinced about Egan's lofty status as a contemporary literary figure. What I do really like about Manhattan Beach is the overarching metaphor of diving as a parallel of and vehicle for Anna's growth into a modern American woman. I also like the multi-character narration, with different voices for each of the three main characters. I can't guarantee that you'll like this -- I went into this knowing there was a good chance that I would not like it. 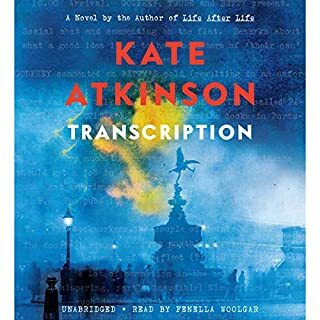 The mixed reviews suggest this is a love-it or hate-it book, and I suspect that hinges almost entirely on whether you like the main characters or not, especially Anna. An incredibly well written novel (no surprise). Jennifer Egan's prose is clear and concise but also beautiful and evocative. 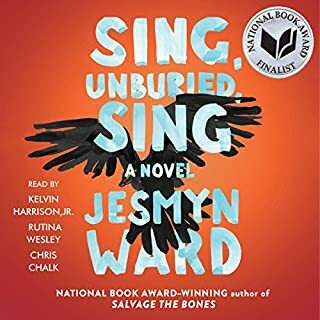 In this case, she puts her talents to use in a straight-forward novel instead of using unique/experimental techniques and structure. Well, the structure is a little bit adventurous.The book follows multiple characters through time and place. Using the first person, Egan shifts narration between characters--but all of the story lines ultimately center around Anna. Her story is compelling, and the way it unfolds makes it even more so. This is a great historical novel with very specific details that make it almost feel like non-fiction. The narration is fantastic. I am convinced that using multiple narrators is the best way to create an audiobook. Heather Lind was especially good at voicing each character differently. Writing is sumptuous yet delicate. Characters are fully realized and intriguing. Story sprawls over history. The best listen I have had in awhile.